The Drywall and Painting Experts! If you’re looking for a contractor specialized in residential drywall installation and repair, as well as commercial drywall hanging, you’re in the right place. Based in Aurora, our company has been gathering years of experience serving the local residents. We serve not only homeowners but also business owners and property managers across the entire region. Industrial facilities also use our services when necessary. Some people call it gypsum board or sheetrock too. In any case, if you’re looking for quality installation for your drywall project, we’re here to assist you. Poorly installed drywall can cost you a lot more money than expected in the long run. Don’t let that happen to you and pick one of the best local drywall contractors in Aurora, IL when your project starts. It will avoid you some extensive repairs later on and will save you some headaches too. Call us regarding your new construction project or your old house, or the residence you just purchased. We will come to take a look and give you a precise quote based on what your exact needs are. Just share the details of your project and we will take a closer look. Preliminary inspections are how we start with any project. We come to your place and perform an in-depth analysis while also assessing the situation and determining what would be the best options for your particular case. No matter what size or texture of your interior’s drywall, we got all the tools and equipment necessary to get it back to its original condition. Simple or complicated, our team can handle any type of project. Locally owned and operated, our business is here to solve all your drywall-related issues. With a team of talented and experienced contractors at our disposal, we are able to tackle any kinds of projects, large and small. 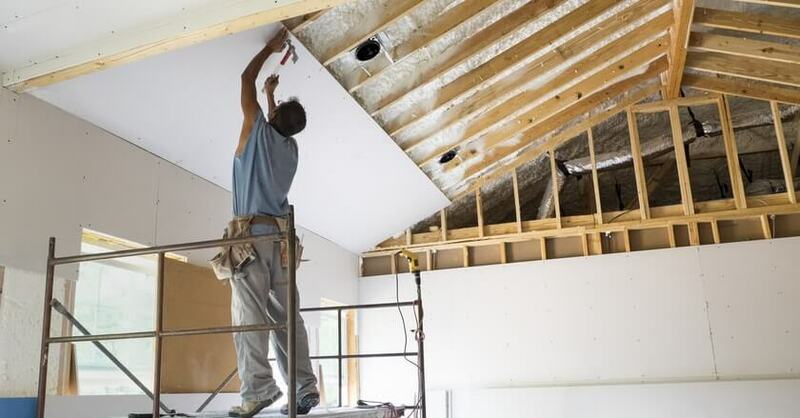 Though drywall hanging is what we do most, we also do ceiling hanging and repair, as well as plaster repair, acoustical ceilings and metal studs framing. You can expect to find all the related services you will ever need in one place. Walls are an integral part of your residence and you want them to be as sturdy as possible. When our team hangs your drywall, you can expect it to be done the right way the first time around. Our expertise and our reliability are unmatched and we work hard to offer the best service possible to each customer. Whether you are a business owner, a tenant, or the landlord, we always have solutions available for you. Drywall finishes and demolition are also among the services we offer to our clients. Regardless of what you need, our contractors will find the way to bring you the right level of service for the job at hand. The main purpose is to offer you the best possible customer experience. Our customer care is second to none and is one of our priorities so we can make sure you’re 100% satisfied with the service you’ve received. Our professional staff does everything drywall and paint related, and includes boarding, taping, and finishing. Though we are based in Aurora, we work throughout the entire state of Illinois, mainly in the Chicago metro area. As a local drywall repair company, we can tell you that damaged drywall needs to be repaired as quickly as possible, most times as soon as you notice it. This is true especially in the basement where it is more humid and damp than other areas of the house. Not only is it an aesthetic issue, but openings in the wall allow critters and mites to get in and create a home out of it. Most homeowners don’t think about how solid their walls are until some cracks start to appear or until they move to a new home. But walls are more important than it seems: they offer privacy and are sound barriers too. Last but not least, they offer additional fire resistance and insulate your home from the cold and the heat. Drywall can be damaged by the settling of your house. Various accidents can also damage it. Your interior play an important part in how you feel and how your home looks. Don’t underestimate it and talk to the pros today to get custom advice and tips on how to pick the right kind of wall for your place. Small holes or new drywall panel hanging…we can do it all. Just tell us what the problem is and we will come to the rescue. You will be impressed by the finished project. We can refinish your drywall with wallpaper, paint, or any other specialty finish you like. Your creative ideas are welcome but if you’re not sure, you can always ask us for suggestions and recommendations. A tiny hole or a small dent on your wall can ruin the mood. That’s when you know you should call us to fix it right away. Don’t let that become the focal point of the room and let a professional drywall contractors restore the look of your walls. You want your drywall repaired as fast as possible and that’s a legitimate request. We aim to be your go-to local drywall repair company in Aurora and we plan to do that by being completely transparent with the work that needs to be done, setting real expectations and then delivering on our promise. We aren’t looking for a one-time service call, instead, we are looking to build clients for life! We understand that there is never a good time for an accident to happen and we also know that when the moment strikes, sometimes you just have to act fast. When you need emergency drywall repair service because water has entered your home and the drywall has been damaged, give us a call immediately. We can help you assess the extent of the damage and we can put a remediation plan in place. Depending on where the repair is needed we may have more time than other areas but most of the times it’s a matter of acting quickly instead of ignoring the issue and hoping it goes away. Just the right amount of humidity in a basement can cause mold spores to germinate and flourish, spreading quickly and can even cause health problems. There are small things that can be done to minimize the chances of that happening, but mold can start to spread in as little as 3-7 days. When it comes to emergency drywall repair service, we do our very best to shift our schedules around accommodate. These types of situations typically revolve around a damaged ceiling or a flooded basement with inches of stand-still water. Either way, whatever your problem may be, we can find a solution for you. Let our crew install your drywall quickly and efficiently. We pay attention to each detail and deliver quality results on time. Installing drywall is generally faster than plastering. We will create the smooth surface needed to apply a fresh coat of paint. Our job is to find the adequate drywall texture to match the existing wall. Drywall repair and installation might be something difficult to handle for most homeowners since you may not have the time, the energy or the knowledge to do it yourself. In that case, we have put together a collection of drywall services for your convenience. All you have to do is to pick up the phone and give us a call to get the information you need and to book an appointment with one of our drywall contractors. You can also contact us for drywall finish and texture. We have been in the drywall construction industry for decades and we will be happy to share our experience with you when you hire us to work on your project. The vast majority of our clients have been extremely happy with the quality we deliver and the prices we charge. Everyone from the management to the operators and specialists working with us is fully committed to the success of your home improvement project. We dedicate our entire attention to the building, demolition, and repair of drywall in Aurora and the surrounding areas of Chicago. In any case, you should know that it pays to hire a professional. Avoid DIY drywall installation and get in touch with us. It is not as straightforward as it looks, even if you watched several videos explaining in detail how to do it. Don’t be fooled, it still requires skills and experience. Save money and the environment by hiring our staff for your upcoming drywall project. We prevent heat loss and can help you to reduce your energy bills in the long term. Try our services and take advantage of our years of expertise. If you are asking yourself what’s the main difference between drywall and plaster and which one you should pick for your wall, our drywall specialists will give you all the information you need in order to make an informed decision. We’ve put together a team of great contractors to help you build the wall your house deserves. Everyone in the company will make sure the project, whether it’s repair or installation, is completed to the highest standards. Unsightly tears and holes will be soon a thing of the past once we’re done with your wall. All it takes is one call and a quote to get started. We come to you when you need someone to repair your walls or ceilings, at home or in your workplace. Check our proven track record to see what our past and present customers have to say about us. Offering a premium service at a price you can afford is why we started this company in the first place. We go beyond our customers’ expectations and go the extra mile to make sure everything is to your satisfaction. Transparent pricing is what our customers love about us. You want efficiency and integrity every step along the way and that’s what we offer. Most of our old customers refer their friends and family members to us because of the good work we did for them in the past. Call us now at 630.360.9430 to learn more about our drywall services near you in the suburbs of Chicago. Ask for a free quote today and compare our estimate to our competitors. You will soon realize that we offer the best value for each dollar you spend with us. We’re looking forward to working with you on your drywall project whether it’s for your office or your house.